Most OTC derivatives are highly standardized, heavily traded products that are more fairly described as unfamiliar than complex. Nonetheless, a small corner of the market comprised of customized, or bespoke, trades has captured the imagination of both the public and the press. The descriptions put forth to date muddle the scale of the market, purportedly in the hundreds of trillions of dollars, with words like "complex" and "arcane," all to convey a sense of simultaneous condemnation -- the result of some vague concept of inherent mischief -- and unholy admiration for the wizards who put these "black boxes" together. In an effort to tone down the more florid descriptions of bespoke trades, what follows is introduction to the market conditions that cause certain market participants to prefer bespoke trades to more standardized alternatives. All financial agreements involve mutual promises to deliver assets and/or cash. But some financial agreements limit the scope of assets that can be drawn upon under the agreement. That is, each party has only limited rights to the assets and/or cash flows of the other. For example, assume that A wants to enter into an interest rate swap simultaneously with the issuance of floating rate bonds. 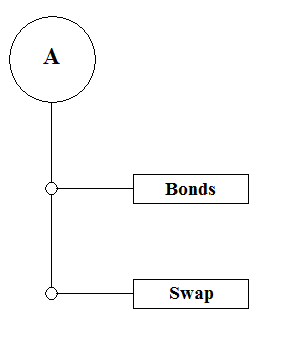 For simplicity's sake, we will assume that (i) the swap in question is a vanilla fixed for floating rate swap where A pays a fixed rate to A's counterparty, swap dealer D, and D pays the floating rate on the bonds to A and (ii) the payment dates on the swap are the same as the payment dates on the bonds. This arrangement allows A to pay the bondholders a floating rate, but still manage its interest rate risk by having its payments under the bonds and the swap net out to an effective fixed rate. But what if the prospective bondholders want to be assured that the swap will not interfere with the credit quality of the bonds? They could insist that A's payments on the swap be made subordinate to A's payments on the bonds. That is, A makes payments on the bonds before it makes payments under the swap. This is a basic payment waterfall. This waterfall must be memorialized in both the bonds and the swap agreement, which means that a standardized swap will not do. In practice, the credit terms of the swap could be much more complex, taking into account various agreements that A has in place, and even differentiate between certain types of payments under the swap, placing each at different levels in the payment waterfall. In short, even the most elementary swap, a fixed for floating interest rate swap, could require intense structuring simply because other agreements require it. Another common motivation for bespoke trades is the lack of a market. That is, the risk in question is unique to the party looking to hedge it or too unusual to support a liquid hedging market. For example, assume that A is a heavy oil consumer in town X. Town X is a major delivery point for oil and so there are exchange traded oil futures that track the price of fuel delivered to X. These futures allow A to do a reasonably good job of hedging its exposure to fluctuations in the price of oil delivered to its town X operations. However, A is setting up a venture in town Y which will also consume a large quantity of oil. The price of oil delivered to Y usually tracks the price of oil delivered to X, but can deviate sharply under certain conditions. As such, A would rather not rely on futures tracking delivery to X, but would prefer a hedge that tracks the cost of delivery to Y. A could enter into a swap with dealer D where A pays a fixed rate and D pays the cost of delivery to Y. The net effect of this all-cash swap is that A has locked in a price for delivery to Y.
I've written a fair number of articles on the OTC market and related topics, but the well of financial knowledge is orders of magnitudes deeper than the information assembled by this lone wonk. But fret not, because The Qatar Financial Center has set up a simply gigantic resource, QFinance, that is fully searchable and contains information on all corners of finance. It is in essence an encyclopedic compilation of the current state of finance. It seems that most of the entries were written by high level practitioners, with others by academics and regulators. That said, it is a gigantic database, so I have reviewed only a small fraction of the entries. In any case, it is certainly worth checking out.